The Philippines has revoked a licence for one of its major English-language news sites, Rappler, igniting a debate about press freedom in the country. Historically, the Philippine media have been considered the freest and liveliest in Asia. Rappler has in the past been critical of the government of Rodrigo Duterte, leading some to say the decision is an attempt at press censorship, though the government argues that the news site violated a clause. But why does this matter? Rappler is an online news site in the Philippines that was first founded in 2012 by former CNN journalist Maria Ressa. The website has grown a reputation for its hard-hitting, investigative journalism and has published articles that have been especially critical of President Duterte. Why is Rappler's licence being revoked? Authorities said the media site, which has two US investors, had violated a clause in the constitution that limits media ownership to Philippine citizens. The two US investors are namely North Base Media, a collective led by former journalists, and Omidyar Network, a self-styled philanthropic investment firm set up by Pierre Omidyar, the founder of eBay. This week, the Securities and Exchange Commission (SEC), which regulates financial dealings in the Philippines, ruled that the money invested in the business indicated that Rappler is owned and therefore controlled by these foreign entities. Image caption Mr Duterte has called Rappler "fake news"
But Rappler maintains that the website is fully "independent". "Rappler is 100% Philippine owned, let me state for the record that we are actually following the Philippine constitution," Ms Ressa told the BBC. "We set up Rappler precisely to be an independent voice and Omidyar Network knows that and wants us to be independent." What has President Duterte said about the site? "Fake News". That's how President Duterte described Rappler. However, he denied that the move to shut it down was a political one, saying he "never had a hand" in the SEC's decision. Mr Duterte first mentioned Rappler in July 2017, saying he believed that the website was "fully owned by Americans". The president had also previously said that many journalists killed in the country had deserved to die. Since 1986, 176 journalists have been killed in the Philippines, one of the most dangerous countries for reporters. How have people reacted to the decision? Many in the Philippines have rallied on social media to show their support for Rappler using the hashtags #DefendPressFreedom and #IStandWithRappler. Senator Paolo Benigno Aquino IV said the move to shut down Rappler was "a win for fake news, and a loss for dissenting voices and free speech". It was "straight out of the dictator's playbook," said Senator Risa Hontiveros. "I urge the public and all media practitioners to defend press freedom and the right to speak truth to power," she said in a statement. Journalists in the region too have spoken up against the decision. 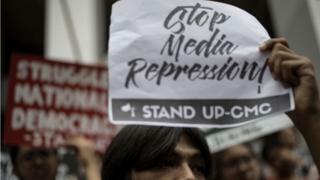 The Foreign Correspondents Association of the Philippines expressed "deep concern" over the SEC decision, saying it was "tantamount to killing the online news site". Similarly, the Economic Journalists Association of the Philippines said that "January 15 will be remembered in Philippine press history infamy. It is the day that a government built on democratic principles struck a blow on one of the pillars of Asia's most vibrant democracy". What does Rappler plan to do next? A spokesperson for the SEC said that Rappler can, for now, still continue its operations because the SEC's order is not final. Rappler has 15 days within which it can still go to the Court of Appeals to challenge the SEC's decision. According to Ms Ressa, Rappler is not going down without a fight. "We will fight this as much as we can, as long as we can. We will exhaust all legal remedies," said Ms Ressa. "But we want to point out that the punishment is too severe, we weren't given due process and this is a press freedom issue." Are there wider concerns about the media under Duterte? There was controversy in November 2017 when a major Duterte campaign donor, Ramon Ang, bought a majority stake in the Philippine Daily Inquirer, a newspaper that had also been critical of the president's war on drugs. President Duterte had previously criticised the newspaper's former owners, the Prieto family, for not paying proper taxes on a property in Manila, and threatened to come up with "an exposé" against the newspaper. Journalists at the newspaper have expressed concern over changing editorial values since the change in ownership. However, Mr Ang says he's committed to pursue "the highest standards of journalism". Have the media always enjoyed freedom of speech in the Philippines? Critics of the government say the ruling against Rappler is a worrying reminder of the past actions of the Philippine strongman Ferdinand Marcos. In September 1972, shortly after declaring nationwide martial law, he ordered the closure of numerous newspapers and wire agencies. Journalists and political opponents were subsequently arrested and interrogated by the military.